MailPoet provides built-in support for the SendGrid API. This means that you can send your MailPoet newsletters via SendGrid over a HTTP connection. 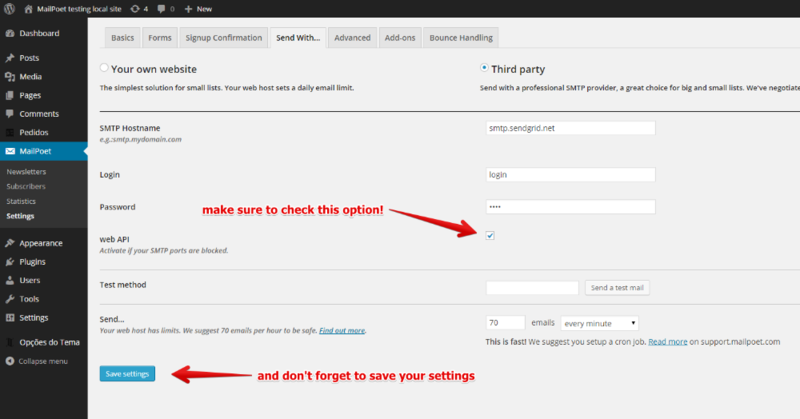 This is good news, because some hosts block the SMTP connection between your website and SendGrid, thus preventing your newsletters from being sent. Make sure to check the option " web API" as soon as you type "smtp.sendgrid.net" on the host field on the "Send with..." tab, if you are using SendGrid to enable the API support. Choosing a sending frequency: how does it work?